Super Typhoon Haiyan was one of the most intense tropical cyclones at landfall on record when it struck the Philippines on Nov. 7. Its maximum sustained winds at landfall were pegged at 195 mph with gusts above 220 mph. Some meteorologists even proclaimed it to be the strongest tropical cyclone at landfall in recorded history. Haiyan’s strength and the duration of its Category 5 intensity — the storm remained at peak Category 5 intensity for an incredible 48 straight hours — raises the question of whether manmade global warming tipped the odds in favor of such an extreme storm. After all, the global atmosphere contains 4 percent more water vapor than there was in the 1970s and global air and sea surface temperatures are higher now than they used to be, due in large part to manmade global warming as well as natural climate variability. These changes would, in theory at least, lead to stronger and wetter storms. 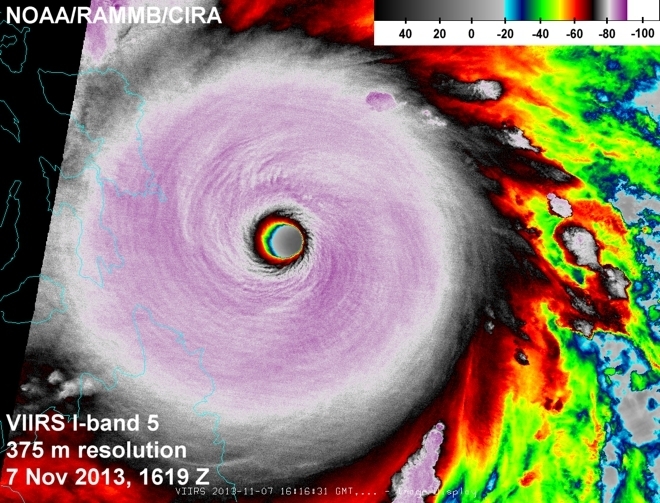 High-resolution satellite image of Super Typhoon Haiyan at its peak intensity on Nov. 7. Graphic showing the total amount of heat energy available for Super Typhoon Haiyan to absorb, not just on the surface, but integrated through the water column. 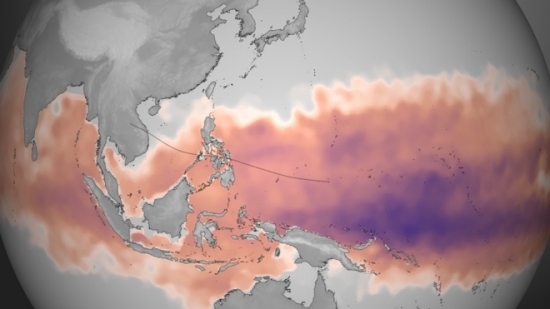 Deeper, warmer pools of water are colored purple, though any region colored from pink to purple has sufficient energy to fuel storm intensification. The dotted line represents the best-track and forecast data as of 16:00 UTC on Nov. 7. Climate research has not yet provided a clear picture of how global warming is altering tropical cyclones around the world. Importantly, though, studies are providing clues that we may be in for a much stormier future, with more intense storms that bring with them stronger winds, heavier rainfall, and greater storm surge due to sea level rise. First, there's what the science says about the present state of the atmosphere. Between the U.N. Intergovernmental Panel on Climate Change’s (IPCC) report in 2007 and the latest report released earlier this year, the science has become less certain on global warming's influence on such storms. 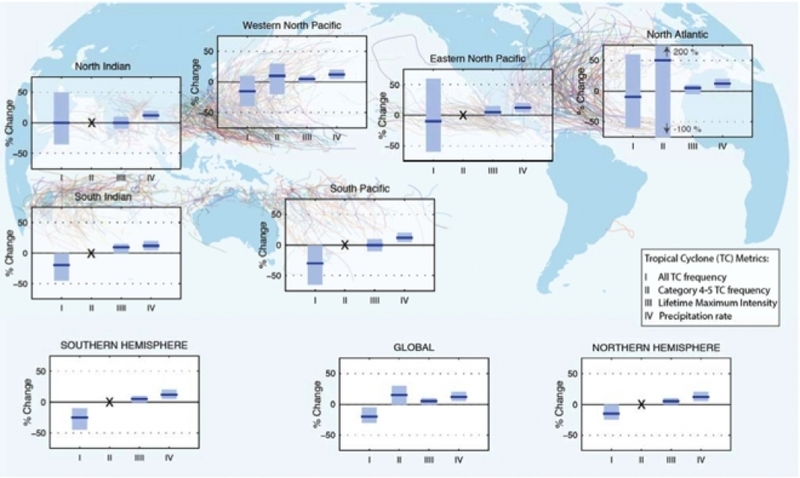 That's partly because the historical records of tropical cyclones, be they hurricanes in the Atlantic or Pacific Typhoons, are full of gaps in the data, varying methodologies and inaccuracies. The most recent IPCC report said: “Globally, there is low confidence in attribution of changes in tropical cyclone activity to human influence.” The IPCC found that insufficient observational evidence, a lack of understanding regarding the physical connection between manmade climate change and tropical storms, and considerable disagreement between studies justified downplaying any detectable changes in tropical cyclones due to global warming. What is clearer and more worrisome than the present picture, though, is what is expected to happen in coming decades, assuming that the climate continues to warm as expected. In general, the latest IPCC report found that manmade global warming is likely to make tropical cyclones produce more rainfall and have higher wind speeds than they typically do now, but the frequency of these storms may decline in some ocean basins. Monster storms like Haiyan may, in fact, become more common in the future, thanks to a readier supply of warm ocean waters and possible changes to atmospheric wind shear, which can tear storms apart, in some ocean basins that could aid such storms (such changes could also inhibit storms in other ocean basins). Some studies have found that manmade emissions of soot in South Asia, in addition to global warming, have already lessened wind shear over the Indian Ocean, leading to an increase in tropical cyclone intensities there in recent years. Projected changes in tropical cyclone statistics. All values represent expected percent change in the average over period 2081–2100 relative to 2000–2019, under a high emissions scenario. The metrics presented here include the total annual frequency of tropical storms, the annual frequency of Category 4 and 5 storms, the mean lifetime maximum intensity of tropical cyclones, and the precipitation rate within 200 km of the storm center at its most intense point. The solid blue line is the best guess of the expected percent change, and the coloured bar provides the likely confidence interval for this value. Click image to enlarge. Credit: IPCC Working Group II. Vecchi, who has published a slew of scientific papers on hurricanes and global warming, told Climate Central that it may not be until the end of this century that a global warming signal emerges in tropical cyclone records. While the scientific consensus clearly skews toward stronger, wetter, but less frequent tropical cyclones in the coming decades, there are some studies that depart from that view. In fact, a study published in the journal Proceedings of the National Academy of Sciences in July found that tropical cyclones are likely to become both stronger and more frequent in the years to come, with a huge jump in storm frequency and intensity in the Northwest Pacific Ocean Basin. 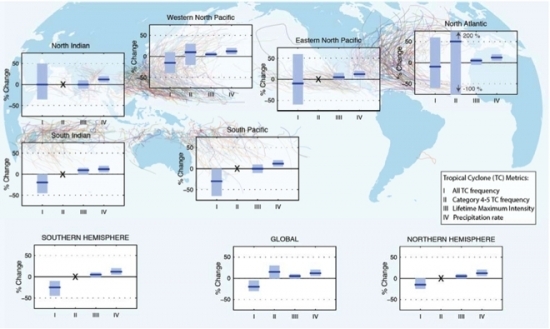 The study, by MIT hurricane expert Kerry Emanuel, used the latest generation of computer models to arrive at its results, but it has not yet been backed by subsequent research from other groups. “It is premature to judge how robust this finding will be” once its techniques are replicated across different computer models and compared to other similar methods, Tom Knutson, a researcher at NOAA’s Geophysical Fluid Dynamics Laboratory in Princeton, N.J., said.